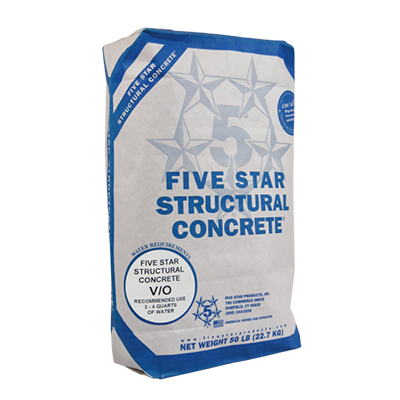 Structural Concrete-ES (Extended Set)- A high early strength, single component, permanent concrete repair material with extended set properties (45 minutes working time @ 70 Deg. F). The extended set properties allow for deep/large volume pours up to 6 Cu. Yds. In a single lift. Application thicknesses from ? to 2 inches neat and over two inches with choice aggregate extensions. Product creates corrosion protection of steel reinforced structures with mitigating corrosion inhibitor technology and has very low chloride ion permeability. Moisture sensitive coatings can be applied in 24 to 36 hours dependent on ambient conditions. 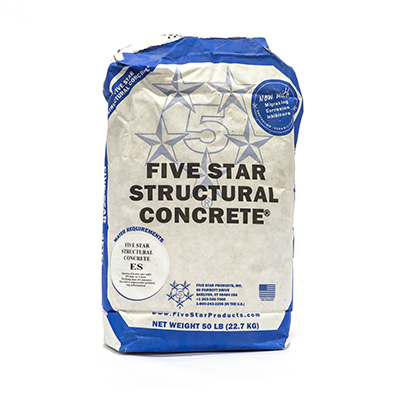 Structural Concrete- A high early strength, single component, concrete repair material. Produces a repair that is dimensionally stable, develops an integral bond to existing concrete, and restores structural integrity within hours of placement. Application thicknesses for ? to 2 inches neat and over two inches with choice aggregate extensions. Product creates corrosion protection of steel reinforced structures with mitigating corrosion inhibitor technology and has very low chloride ion permeability. Moisture sensitive coatings can be applied in 8 to 24-hour dependent on ambient conditions. Structural Concrete Gunite WP/FS- Is a wet process shotcrete applied permanent concrete repair product. It is high early strength, fiber reinforced, single component, enhanced hydraulic for repairs from ? inch to full depth applications and long finishing time. Product creates corrosion protection of steel reinforced structures with mitigating corrosion inhibitor technology and has very low chloride ion permeability. Structural Concrete S300 (Extra Extended Set)- Is a normal setting (60 minutes working time @ 70 Deg. 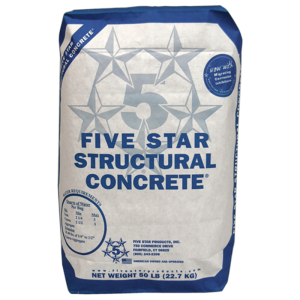 F), single component, enhanced hydraulic cement mortar used for pourable or pumpable repairs of concrete structures. Application thicknesses from ? to 3 inches neat. Over three inches with choice aggregate extensions including pea-gravel to course aggregates for large volume repairs and foundation restorations. Product creates corrosion protection of steel reinforced structures with mitigating corrosion inhibitor technology and has very low chloride ion permeability. Available in bulk packaging (3,000 lb. Crane Bag). Structural Concrete V/O (Vertical/Overhead)- A high early strength, single component, rapid setconcrete repair material for vertical and overhead applications. 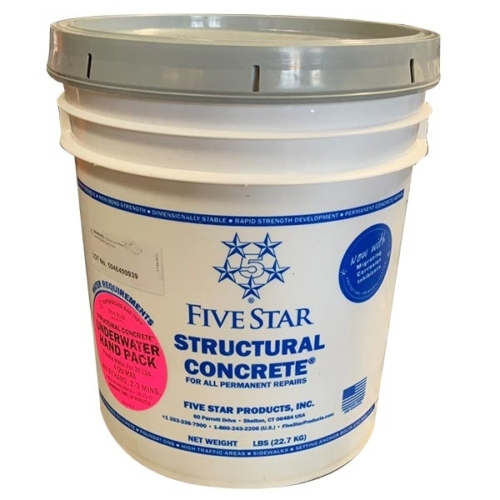 Produces a repair that is dimensionally stable, develops an integral bond to existing concrete, and restores structural integrity within hours of placement. Application thicknesses for ? to 2 inches neat and over two inches with choice aggregate extensions. Product creates corrosion protection of steel reinforced structures with mitigating corrosion inhibitor technology and has very low chloride ion permeability. Moisture sensitive coatings can be applied in 8 to 24-hour dependent on ambient conditions. Five Star Novolac Structural Concrete? is a three component, 100% solids, highly chemical resistant epoxy repair material for the construction or repair of curbs, trenches, floors and pads. 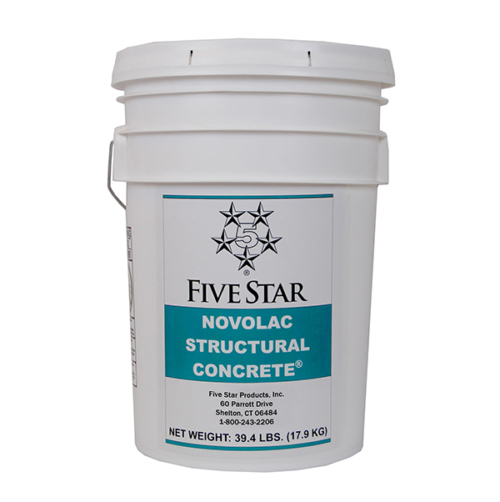 Five Star Novolac Structural Concrete? 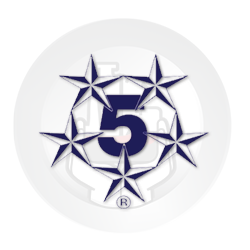 is designed for aggressive chemical environments that may be exposed to concentrated acids, alkalis, corrosives or solvents.